One of the many lost wrecks cluttering the bottom of Lake Huron off Pointe aux Barques, at the tip of Michigan's Thumb is the tugboat Fred A. Lee. The Lee foundered Nov. 13, 1936, about 13 miles northeast of the light in broad daylight while an officer on a passing freighter was watching. There is a mystery surrounding this wreck. The cause of the vessel's sinking has never been explained. There was speculation at the time that the ship's boiler exploded, but divers who have since discovered the wreck say the boiler is intact. That was not the cause. Sailors said a heavy sea was running that afternoon, but it wasn't thought serious enough to have caused a stout old boat like the Fred A. Lee to break up and plunge to the bottom so quickly that it trapped her crew. Others thought the nearby freighter, the stone carrier John Munson, ran the vessel down, but divers say the damage to the wreck doesn't indicate a collision. The skipper of the Munson, Captain Theodore Dahlburg, said his first mate, Donald Mauts, watched the tug disappear at 4:28 p.m. When the Munson got turned and back at the scene, all that was found was splintered wreckage from a ship's cabin, a chair, mattress, pillows and a life preserver. No bodies were recovered. Lost with the Lee were Capt. Achille Renaud, of Amherstburg, Ontario; chief engineer Cecil Smale of Port Stanley, Ontario; second engineer Archie Gibb of Corunna, Ontario; fireman P. Titus and wheelsman Roy McDonald, both of Sarnia, Ontario. The men were taking the tug on its last trip of the season, from Wallaceburg, Ontario, where it had been chartered for the summer by a sand and gravel company, to winter quarters at Sault Ste. Marie, Ontario. The tug's trip had not been a good one. The Harbor Beach Coast Guard said the vessel went aground on a sandbar near that community the night before and had to be pulled free. Guardsmen speculated that the grounding may have damaged the tug's wooden hull more than the crew realized. The tug was found in 200 feet of water by divers for Undersea Research Associates in June, 1994. 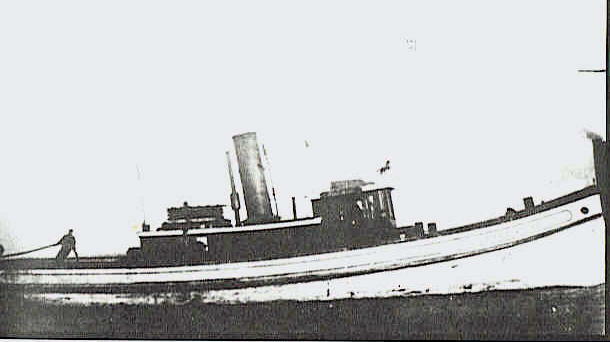 The Lee was a wooden vessel measuring 70 feet in length. It was built in 1898 so had been in service for 15 years at the time it sank.